Microbiologist Hendrik Jonker set his mind to solve this problem. Whilst thinking about how the body can heal bone through mineralization, he looked into whether a similar method could be used with concrete. By mixing it with limestone-producing bacteria, he found that any cracks that formed in the concrete were patched over. He called that material as ‘BioConcrete‘. How BioConcrete material heals itself? The bacteria, either Bacillus pseudofirmus or Sporosarcina pasteurii, are found naturally in highly alkaline lakes near volcanoes and are able to survive for up to 200 years without oxygen or food. They are activated when they come into contact with water and then use the calcium lactate as a food source, producing limestone that, as a result, closes up the cracks. When the concrete cracks and water enters the gaps, it comes into contact with the bacteria and the food source, setting the healing process off. The bacteria then feed on the calcium lactate, joining the calcium with carbonate to form limestone, fixing the crack. This sounds quite good but we also have to take care of the cost. The process has been proven to work effectively, and can even be added to a liquid that could then be sprayed onto existing buildings. It is currently twice the cost of traditional concrete. This is mainly due to the price of the calcium lactate, and if they can get the bacteria to use a sugar-based nutrient instead, the price would be dramatically reduced. This great invention can change present scenario. BioConcrete (self-healing material) being used in bridges, tunnels, roads and other buildings, with the bacteria laying dormant for centuries and only ‘coming to life’ when needed. This is also known as ‘living concrete‘ as it heals its cracks like the human body. In the future, we may be surrounded by concrete structures, which are able to self-heal cracks in their structure, with special bacteria doing the job for us. 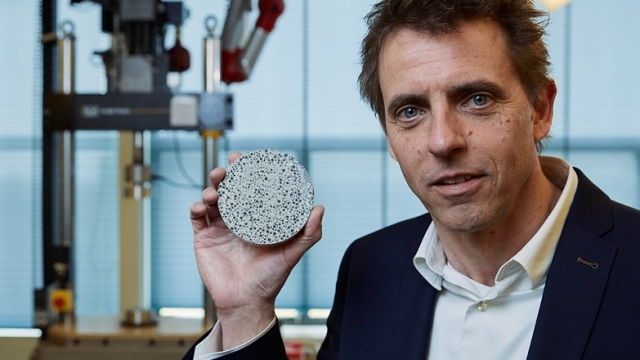 This new self-healing concrete is being trialled in the UK. Grew up in Indore, M.P. I am pursuing B.E. in Electronics and Communication from Medi-Caps Indore. I love writing, sports and playing piano.